With her abundant energy and enthusiasm, people seldom guess EARTH graduate Yesenia Castillo’s quiet and shy nature, she says. Yesenia (’98, Panama) has joined a field that has traditionally afforded women in Latin America few opportunities. As she knows, cattle ranching offers farmers and their families a plethora of benefits: income, food for the home, fertilizer, and dairy and meat to bring to market. On most of the continent’s large-scale ranches, according to the World Bank, men do the work. Women, however, are now getting more involved in livestock disease prevention and control. Since thirty percent of livestock production is lost to disease in the developing world , such work is key to helping increase livestock productivity. 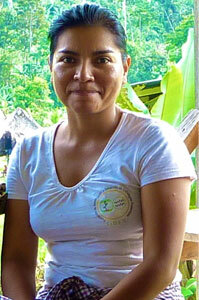 Yesenia, amazingly, plays an active role in both sectors of cattle ranching. She graduated from EARTH thanks to a scholarship from the Norwegian Government. After working for several years in cattle farm administration, in 2005 she started her own business in the Chiriquí Province of her native Panama called Asociados Terranova S.A. The company provides consulting and educational services in agricultural best practices and has trained hundreds of farmers from marginalized, rural communities in sustainable agricultural techniques, traceability (tracking and minimizing livestock disease risk), waste management, sustainable water use and biodiversity. Today, in addition to providing agricultural extension, the company also owns and operates a 300-hectare cattle farm and provides services in cattle management, reproduction and trade. The business employs 16 farm workers, the majority from indigenous communities. Then, the company began importing and marketing Cheminova brand veterinary products. It also sells Tru-Test pH balancing tests, property fencing, traceability equipment, products for artificial livestock insemination, and other products for cattle ranchers. Yesenia and her team also manage both their own and others’ cattle and share technical information with the private sector and the government. In 2009, she also led “Naturally Panama,” an environmental education program. For her leadership, she received the “Outstanding Member Award” from Junior Chamber International, a non-profit youth service organization. Yesenia speaks passionately about the national need for a more results-oriented education system. As an employer, she adds, “I’ll hire not necessarily someone with experience already, but who truly wants to learn and contribute.” She tries to nurture such curiosity and commitment in her students. So, she now directs Culebra Model Farm, which she created in the remote indigenous region of Culebra, Bocas del Toro. There, she trains adolescents, teachers and small-scale producers in sustainable cattle management practices that preserve forests and responsibly manage resources. In her approach to teaching, Yesenia carries the “holistic” preparation from the University with her. “EARTH’s philosophy–freedom with responsibility–means a lot to me. It teaches you commitment, team work, passion, about living in community.” For such gifts, she expresses her deepest appreciation.